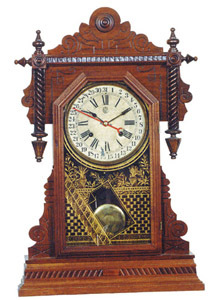 Waterbury Clock Co. shelf clock, "Buffalo", with simple calendar movement. Refinished walnut case is 27 inches high, complete and original. 2 labels on the back, original glass and pendulum. 8 day signed movement, hour and half hour strike on a coil gong, runs strong. Signed dial is dark, but very nice. Ly-Waterbury No.254.